Usually somewhere between 5-10 months of age, a hemipenile bulge will develop at the base of the tail of a male. They become sexually mature at about 6-9 months of age, but they're usually a little small to be put in with a big female at that age. I generally wait until they weigh at least 20-25 grams before I consider putting them in with a female, and even then it is dependent on the size of the girls. If it's a young male going in with a bunch of three year olds, I wait until he's bigger. Don't forget that outstanding males are always more valuable to a breeder because his genes can be passed on to literally 10 times more offspring. In other words, choose your males wisely, and that's where you should be making the biggest investment. Once the female is about a year old and in the 25-35 gram range, she will be able to start producing eggs. They will usually lay a clutch of infertile eggs if they have not yet been exposed to a male. At this time, we recommend going ahead and putting a male in with her, if you haven't already. A big/fat female is not always a healthy, productive breeder, so take it easy on the baby food if you're trying to fatten a female up in order to make breed her sooner. Size isn't as important as the nutrition she is getting. Gravid females will have plenty of hormones telling them it's time to eat up! The hatch rate of eggs from first year breeder females is generally lower than is the case with eggs produced by older females. Don't get discouraged if you get some bad eggs from a first time breeder. A healthy, mature (2+ years old) female will generally lay a clutch of two eggs every 25-40 days. They will breed year round, but females tend to "shut down" after 7-9 clutches, and then start again in 10-12 weeks. Some breeders (I used to be one of them) think it's a good idea to take the male out and let your females rest for 2-3 months a year, but after a decade of breeding tens of thousands of these geckos, I can tell you with absolute certainty that it's unnecessary. Best case, nothing different happens. Worst case, you get a shortened breeding season and/or infertile eggs next year because the male wasn't there when he needed to be. 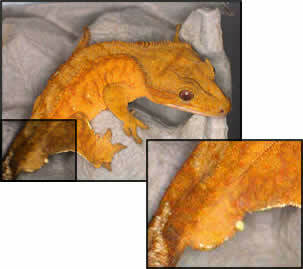 Breeding the crested gecko in captivity can be a very rewarding experience. Although slight changes in temperature can be helpful, Crested geckos do not need to be cooled or require any kind of temperature cycled to breed successfully. For the past decade or so, we have kept males and females together year-round. There is absolutely no factual basis to the myth that you must remove the males in order for the females to "rest" for the winter. Truth be told, removing the male has no impact on an egg-laying female, and they just don't mate very often. Females can retain sperm for the entire breeding season, so if the idea is to prevent more eggs from being laid, you'd be better off dropping the temperatures. I have seen females lay 8 clutches, all fertile, after the male was removed. This is where they lay their eggs. You likely won't see fertile eggs for at least a couple months after the geckos are introduced, but provide a nest box anyway. We even raise our juveniles with nest boxes (humid hides) so that geckos will become familiar with it. After 60 days or so, it's good to get into the habit of checking for eggs. I check for eggs almost every day due to the number of females kept in each enclosure. If you only have one female, you don't need to start checking for eggs until about 25 days after the last clutch was laid. If you use any type of heating, which we generally do not recommend, the nest box should be placed on the coolest end of the cage. For a nest box, I use a 4-6 quart container with a 3-4" layer of substrate. The substrate I use is a mixture of 50% coconut fiber, 50% peat and a pinch of play sand to help with packing. I moisten it until it's wet enough that it will make a "snowball" when packed, but not so wet that water will drip out when squeezed. This mixture packs well, absorbs and holds moisture well and is safe for the eggs. This mixture is just something that kind of evolved here over the last several years, but it seems to work better than anything else I've tried. I cut a couple holes in the lid of the nest box container so that geckos have multiple points of exit/entry, and it helps maintain moisture levels in the nest box. This gives both the males and females a cool, humid retreat, as well as a place for females to lay their eggs. Eggs should be kept at room temperature. The cooler they're kept, the longer it takes to hatch...conversely, the warmer they're kept, the faster they'll hatch. Although the idea of having eggs hatch faster sounds good, hatchlings that hatch earlier tend to be smaller and sometimes even weaker than normal. The general rule of thumb is that longer an egg incubates, the larger/stronger the hatchling. That said, it's probably best to keep eggs in the mid 70's, although fluctuating temperatures are OK too. Depending on the temperature in the room, eggs usually hatch after 60-90 days, with the average being about 70-75 days. In the winter, when temperatures are cooler, eggs can take as long as 120 days to hatch. I used to mix perlite at 1:1 perlite to water by weight, I recently started doing 1:2 (perlite:water) and we rarely have to add water. The trick is to make sure the perlite is relatively deep in comparison to the diameter of the container. Some breeders mix it a bit on the drier side with good results too. I use 6.75" round deli cups, which are about 3" deep. I put in pproximately 2.5" of dampened perlite. I like to have just a few ventilation holes in the egg box, but this is not necessary if you open the box periodically. Egg boxes are checked for moisture every week or two. If you weigh the nest box once it's set up, any water that may have evaporated is replaced by simply pouring water back in. Generally speaking, we don't have to add water before geckos hatch, but if you're not confident in the ability of your egg box to contain humidity, it might be smart to weigh the box and be safe. If you're using perlite, it's not necessary to remove the eggs or stir the mixture when adding water. Just be careful not to get any of the eggs wet, and the water will disperse evenly throughout the perlite on its own.